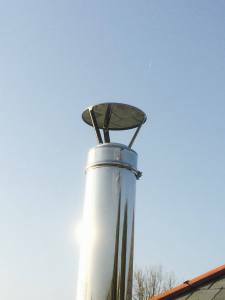 Twin wall flue is exactly as its name implies. It’s twin walled. There are two walls or casings: an inside layer and an outside layer. Between the layers, it is insulated – typically with Rockwool. Both layers are made from stainless steel. Therefore the outer layer is chrome in appearance, however it can also be powder coated (typically black) to change its appearance. Twin wall flue systems are used when you don’t have a chimney. The flue is made up of components that fit together. Just like Lego – only more expensive! 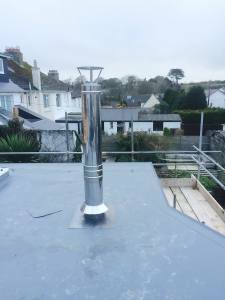 There are different flue lengths, adjustable lengths, various supports & substantial fixings, finishing plates, adapters, cowls, and such like that all connect together to form a new flue that is safe, sealed and well supported. 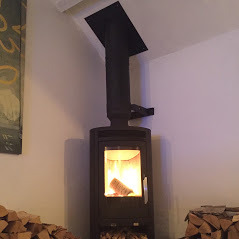 Unlike the flexible flue liners this flue system is non-specific to burning – meaning that it is fit to burn smokeless fuel if you wish. The flue system is also rigid and not flexible. It is however cylindrical in shape, and as it is twin walled, the diameter is larger. Typically this is 8”/150mm. 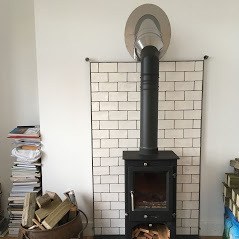 The outside layer of the flue can get hot to touch and therefore when it is fitted, any combustible material such as plasterboard and wood must be at least 2”/50mm clear of its surface. The components of the system are designed so that once installed – the finished product although industrial in appearance – looks great. 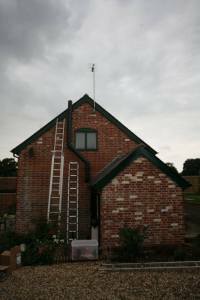 The flue can be designed to run either the inside or the outside of your property. 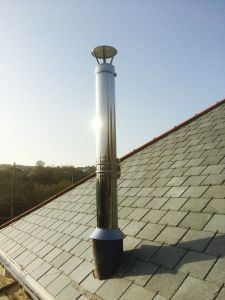 You will be given choices to either keep the flue in its natural chrome appearance or to upgrade it at various points to another colour such as black. For example you may want the flue to be black in the living room and then kept in chrome thereafter. As with all our twin wall flue installations, we will be guided by building regulations to determine the flue height and termination point. Consequently from the last support, a combination of structural locking bands between the flue sections may be used. A rigid arm support kit may also be required. 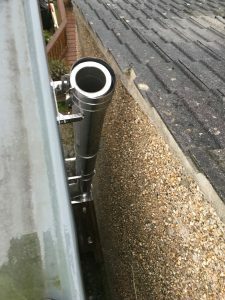 This will brace the flue against the roof and consists of two support arms, which are normally attached to the rafters and the flue. 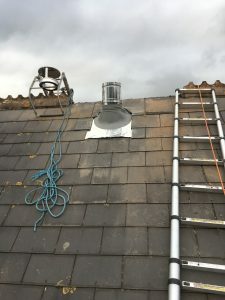 A standard rain cap will terminate the flue as we believe that a simple cowl is best to allow free movement of the by products of combustion. 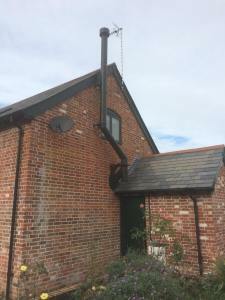 If there are issues with the flue system such as down draught, then a cowl specific to this can be retro fitted. As this type of installation is a mix of a flexible flue liner and a twin wall internal installation, the majority of information can be acquired from reading the information provided in a flexible flue liner installation and a twin wall internal flue installation. 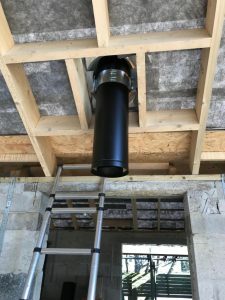 An anchor plate is used to convert the flexible flue liner to the twin wall flue at the point where the chimney breast terminates in the loft. We ensure that this anchor plate is fixed securely in place.